On the Okinawa map you can find every sightseeing spot and city that is worth a visit. 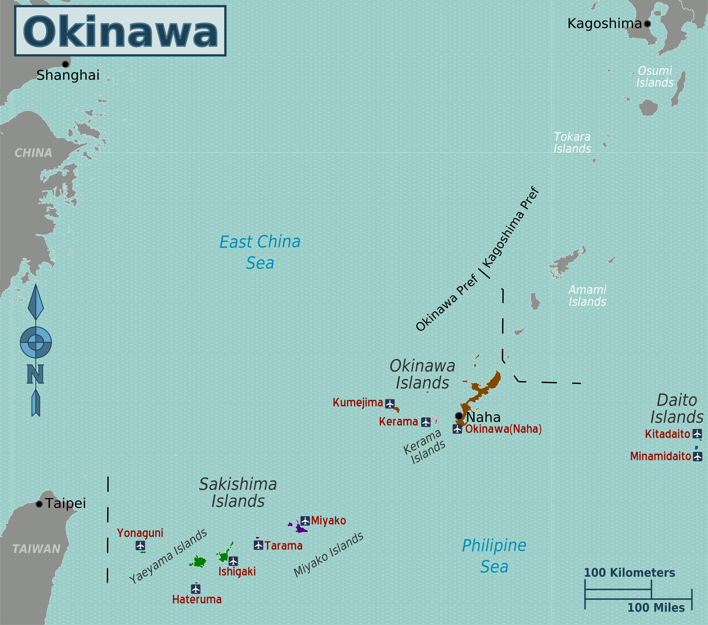 The map offers a solid base for the planning of your journey to the Okinawa islands. The islands of Okinawa consist of around 160 large and small islands of which 49 are inhabited. They are all scattered around in the East China Sea and can be categorized under their own region. The most famous regions are Okinawa Main Island, Kume Island region, Yeayama region and Miyako region. Additionally, there are some small islands scattered around the East China Sea like Kita Daito, Minami Daito, Kerama, Izena and Ie Isand. Read more on our getting there page how to get to every island. Our map focuses on the Main Island Okinawa and its capital Naha. The main Island can be split up in three parts, the Northern part, Central part and Southern part. The northern part is the least inhabited of the Island since it is mostly a National Park with Mount Yonaha at the center. The capital Naha lies on the most Southern part together with the other major towns Tomigusuku, Itoman, Nanjo Urasoe and Ginowan. The famous mister Miyagi Island is located on the east side of the central part of Okinawa. This is the place were the teacher of Karate Kid originally came from (from the Hollywood blockbuster). When you are booking a flight to Okinawa Japan you probably want to fly on Naha Airport since this offers direct flights with the mainland Japan, China, South Korea, Guam, Taiwan and Hong Kong. The infrastructure on the island is great so don’t worry about getting around. You can take public transportation to every corner of the Island. With the help of our Okinawa map you will know exactly where you are and where to go. Many locals speak English because of the long occupation of the US and the international tourist visiting the islands every year. Lees hier verder in het Nederlands over Okinawa. Lesen Sie mehr über Okinawa in deutscher Sprache. Okinawa-Japan.com provides reliable travel advice and information on the Okinawa Islands of Japan. We hope that you enjoy Okinawa and wish you Japanese tropical stay. Do you want to become a partner of Okinawa Japan?